Hello and happy Tuesday. It's time for another challenge at CASology. 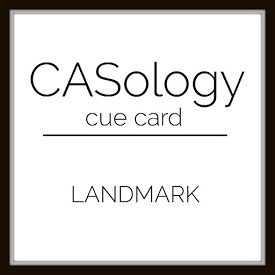 This week, our cue word is landmark. I must admit to becoming a bit of a news junkie since the election last fall. The plight of refugees and immigrants has been on my mind, and it seemed like a great time to pull out Lady Liberty herself, the Statue of Liberty--one of my favorite landmarks. Now it's your turn. How does LANDMARK inspire you? I hope you play along this week. Please remember to keep it Clean and Simple. Our Guest Designer is Wendy. The fireworks are a fun addition to Lady Liberty Joyce! Terrific card. It's a landmark I hope to see one day! Glittery awesomeness Joyce! Love the added fireworks. Those fireworks are great, Joyce!!!! Reading your comment, I love the sentiment you choose for your card!!!! Lady Liberty looks beautiful!!!! Wonderfully done!!!!! So nice of you to think of Lady Liberty with all that is going on right now...I love your sparkly statue and how you added fireworks to your design, Joyce! Fabulous take on the cue card! This is perfection!!! Love the green Statue of Liberty!!!! Gorgeous card and a great Landmark! Brilliantly done, Joyce and a beautiful card on so many levels! You have reminded me that I actually own some of this awesome EP! I must, MUST, MUST use it!